A personal journal of gardening in the Boston area, drawing on my years of experience as an amateur gardener, training as a landscape designer, and experiences as a volunteer at the New England Wild Flower Society's native plant garden, Garden in the Woods. Your comments are welcomed. Garden in the Woods guides visit Tower Hill Botanic Garden in late June, 2005. The Big Bugs exhibit at Garden in the Woods. I just spent a half hour turning my compost piles, so I thought it would be a good time to talk about compost. Sooner or later, most serious gardeners who have any sort of space available for it start their own compost piles. Making compost is a win-win situation - it helps you to cut down on the amount of garden debris that you put into the waste stream, and it makes your soil richer at the same time. There's no big mystery to make compost. Well, there is a little bit of mystery if you want to make your compost fast. In that case, you may need to pay careful attention to what you put into your pile and how wet it is and what type of container it's in. But if you're willing to just let it sit and decompose for a season or two, then it's really pretty easy. The first question is what type of compost bin to use. I started out with a wooden plywood bin that the previous owners of the house had created. You put things in the top and then removed the finished compost through a tiny little door in the bottom. I found this didn't work at all, as the compost took forever to decompose and it was a pain to try to get it out of the little door. I finally settled on a 3-bin system, which seems to really be optimal. The new material goes into the bin on the right (assuming you're right-handed). When that's filled you pitchfork it over to the middle bin and continue filling the right-hand bin. And when it's full again, you more everything down the line once more. You eventually get finished compost out of the third bin. (The order is important because, depending on your handedness, it's a lot easier to toss the pile in one direction than in the other.) The process of moving the piles from bin to bin aerates the piles, breaks up lumps, and remixes the material, all of which help the composting process. The picture above shows my bins after I just finished moving everything down, so there's almost nothing in the first bin. The big pile in the second bin is partially broken down and will compress in size by the time it moves on to the third bin, which is pretty much ready to use compost. What's going on in there is really a complicated biological process whereby soil bacteria break down the vegetation into humus. To do their thing, the bacteria need both carbon (which comes from dried plant materials) and nitrogen (which comes from green plant materials). If you're going for speed, there are optimum ratios to aim for, but if you're being casual about it, it's sufficient to just try to have a mixture of both types of materials. For example, don't put in a huge pile of grass clippings without mixing in some dried leaves or other dried materials. I usually have more garden debris over the season than I have room for in my bins, so I just put the material most likely to break down quickly into the compost. 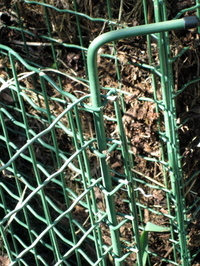 If you want to compost twigs or other woody stuff, it would be best to run it through a chipper/shredder first, to break it up into smaller pieces. I just give up and put the woody stuff out for my town's yard waste collection days. After giving up on the wooden bin, I eventually found these wonderful plastic-coated wire-frame bins that are just the greatest. I don't know how old they are - probably about 15 years or so - and they are still in perfect condition. Each bin is formed from four panels that are held together by a pin that goes down the corner. I don't know if you can see it in the closeup picture, but each side curves outward at the edge, so when you push two sides up against each other, they cross over and make a space that the pin gets pushed down through. It's a very simple and elegant system and works perfectly. And you can just pull the pins out to open up the entire front, like in this next picture, which makes it much easier to get at the bottom half of the pile. This system produces more than enough compost for me each year. I spread a few buckets each time I turn over a bed in my vegetable garden, and add compost to the soil anytime I dig it up to plant anything anywhere. Why is it good to add compost to the soil? The main reason is that it improves the soil structure. The soil in my area is heavy clay, which means the soil particles are very small and packed together, leaving little room in between the particles for air, water, or roots to penetrate. Adding humus to the soil lightens it up and adds little air pockets, which makes it easier for the plants' roots to penetrate and take up moisture and nutrients. One thing to watch out for, by the way, when working with compost is what critters may be lurking inside. This morning I was scooping up a pile of grass clippings left over from last fall, and first found a small snake, and then got my thumb stung by a bee. In fact, there was a whole colony of bees that had built a nest under the pile. It hurt like the dickens, so I stuck my thumb in ice water for about an hour, and that seems to have done the trick.